Also known as The Lios, Irelands largest stone circle has over 100 stones nestled against a huge bank of clay over 1 metre high and some 10 metres wide, the picture top left shows a stone flanked entrance to the circle cut through the bank. 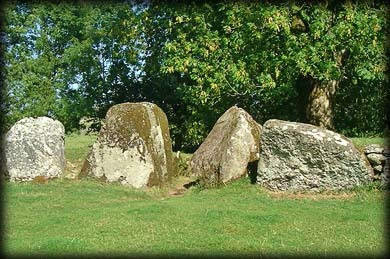 The stone circle is about 48 metres in diameter and including the bank some 70 metres in diameter. 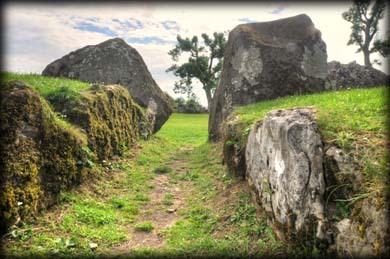 The image on the right shows the two entrance stones pictured from inside the circle. 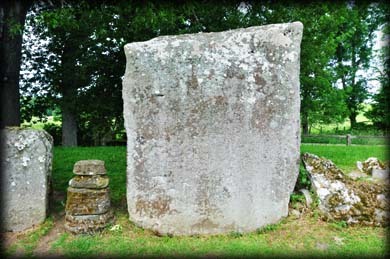 The huge stone pictured below situated north of the entrance stones known as the Crom Dubh stands at approx 2 1/2 metres high and weighs over 50 tons. The fence around this huge monument was built at the local farmers expense and a small contribution of 2 euros is all that is expected. Situated: From Bruff take the R512 North about one kilometre after the first crossroads you will see a small car park on your right the monument is well signposted and clearly visible from the road. Discovery Map 65: R 6322 4045. Last visit July 2015.